Medical laboratory technicians are an important part of every health care team, conducting the lab tests that assist in the diagnosis and treatment of diseases. M State offers its MLT program in a flexible combination of online courses and on-campus labs. 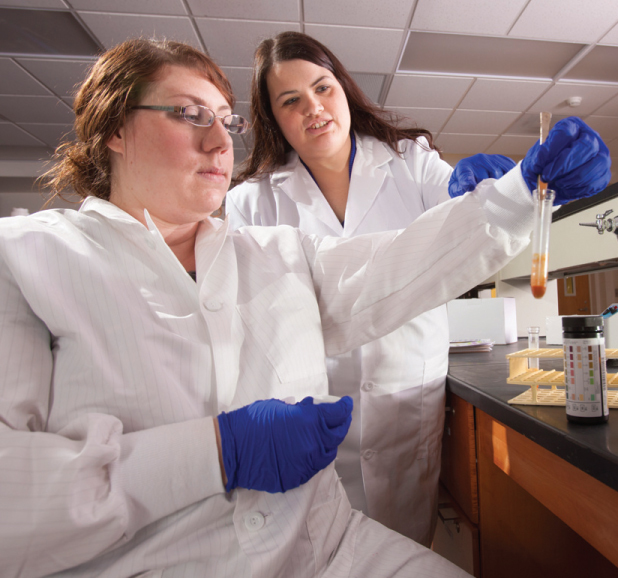 M State's 60-credit Associate of Applied Science degree in Medical Laboratory Technology prepares students for lab technician positions, primarily in hospitals and clinics, where they test specimens to help physicians make medical decisions and determine treatment options. The two-year program includes three semesters of general education, science and MLT courses, followed by 20 weeks of clinical experience in an affiliate hospital laboratory. General education and MLT lecture courses are taught online, and MLT labs are conducted on the Fergus Falls campus once or twice a week. Students enrolled in the MLT program receive phlebotomy training during the fall semester of their second year and are then qualified to work as phlebotomists while they complete the MLT AS degree. Graduates are prepared for the MLT Board of Certification exam, and the program is accredited by the National Accreditation Agency for Clinical Laboratory. Graduates can choose to continue their education in a bachelor's degree program. An articulation agreement allows the seamless transfer of MLT degree credits into the Medical Laboratory Science Program at the University of North Dakota in Grand Forks. Students in the MLT program must have current immunizations and undergo a criminal background check. Medical laboratory technicians perform a wide range of routine laboratory procedures associated with blood and body-fluid analysis. In cooperation with affiliate health care facilities, the college offers a two-year hybrid program (online lectures, campus-based labs) for training medical laboratory technicians. The curriculum includes general education, science, medical laboratory technician courses and a 16-week clinical experience at an affiliate health care laboratory. Upon completion of the program, students are prepared for the American Society of Clinical Pathology (ASCP) Board of Certification exam and employment. The majority of Medical Laboratory Technology graduates work in hospital and clinic laboratories. Graduates may articulate to a four-year institution to receive a bachelor of science degree in Medical Laboratory Science. M State's Medical Laboratory Technology program has an articulation agreement with University of North Dakota. Graduates from M State's Medical Laboratory Technology program can transfer seamlessly into UND's bachelor degree programs in Medical Laboratory Science.